Anyone who played an instrument as a child remembers his or her first trip to the music store. Maybe it was a Guitar Center, the national chain that has become synonymous with music equipment. Or maybe it was a locally-owned store that pays more attention to customer service than making sales quotas. And maybe that store was Motor City Guitar in Waterford, a nondescript store -- aside from the two 30-foot Les Paul guitars flanking the entrance -- that is home to one of the most robust guitar and effects pedals inventories in the Midwest. 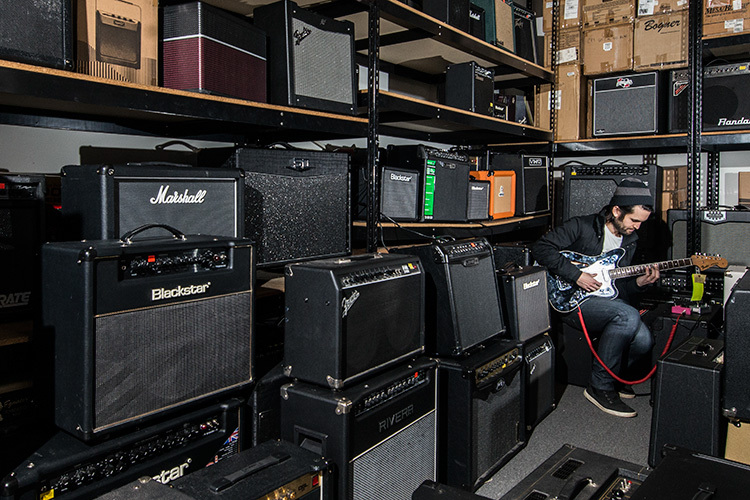 Long-term devotion is the cornerstone of Motor City Guitar's longevity. Even at a time when the music business as a whole is flagging and other stores are closing left and right, people still support Motor City Guitar and its owners, Marty and Mellisa Minuis. "Motor City Guitar is an anomaly in that it has been able to withstand every genre," says Sean Lynch, guitarist of local dream-pop outfit 800beloved who also mans the effects pedals counter at Motor City Guitar. "From late '80s metal to '90s grunge and alternative rock, to all the other offshoots in the break of the early 2000s. It doesn't really cater just to one genre or style of musician." Part of this stems from the Minuis' unique understanding of musicians' needs. "I've played guitar since I was 10 years old, and Melissa played piano and clarinet since she was a kid as well, and guitar after we started dating in high school," says Minui. "I was one of those kids who lived, ate, and breathed guitar. I spent about 10 hours a day figuring out Jimmy Page and Randy Rhoads licks using a record player, old-school style." Marty and Melissa opened Motor City Guitar in 1988, around the time they got married. Both were going to school while working multiple part-time jobs. They wanted something steady, so they opened their own tiny store in the strip mall across the street from Waterford Mott High School. About half of the inventory was Minui's own personal collection. "Things have changed a lot in the small business world since the 1980s," he says. "Back then we were able to open the store based on a $700 investment. That and years of long hours and hard work, of course. There are plenty of nights where we don't eat dinner until midnight and go to sleep at 4:00 a.m., but when you love what you do it makes that a lot easier." Passion is the foundation on which Motor City Guitar stands -- his enthusiasm for the instrument is irrepressible. "Like many guitar players, I remember how excited I was when I first learned 'Smoke on the Water' at my first lesson – that was the greatest feeling in the world." And one he loves to see happen for new guitar players, again and again. Lynch says the Minuis regularly make concessions for customers as part of their good business practice. "I'm able to help a young person get a guitar and use my own discretion if they don’t have enough money or need to get the price a certain way," he says. "That's the experience right there, when you see some kid who thinks he doesn't have enough money then his or her eyes light up and you see the wheels spinning – that is the big thing Marty and Melissa are interested in. That joy is what has kept them in this for this long." Lynch adds, "This is a good, honest place where you can get good, solid equipment, and you don’t have to go through the ballet of commissioned salespeople who have quotas to make." Motor City Guitar carries tens of thousands of different items, everything from major brands that offer hundreds of models like Fender and Gibson to tiny independent manufacturers that make just one style of guitar pick. They also carry products that have only a handful of dealers in the United States -- some are small, independent American manufacturers, others are difficult to find imports. Inside the store you'll find guitars, basses, drums, P.A. and recording equipment, as well as more niche items like ukuleles, banjos, mandolins, and resonators. Lately, they've dabbled into synths and sound modules, and plan to open a vintage guitar department in the near future. But if you really want your mind blown at the proverbial 11, the most impressive collections are the guitars and effects pedals. 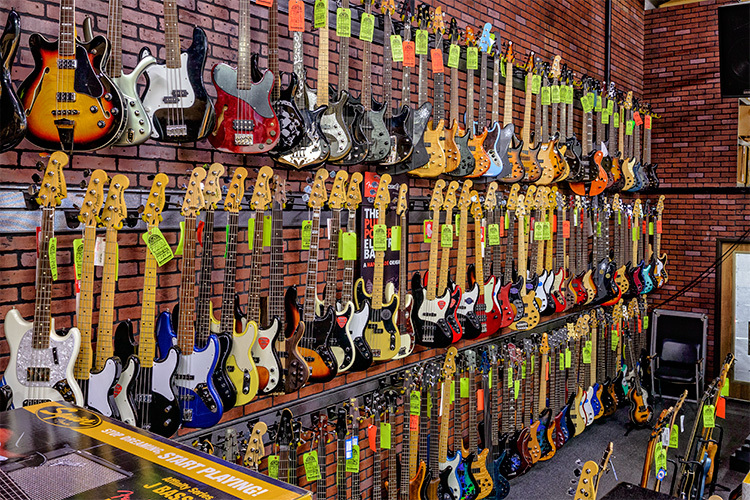 Motor City Guitar stocks several hundreds styles of guitars, and guitar pedals are one of their specialties. They stock at least 1,400 different models from over 100 different manufacturers. And you can sample these pedals to nail the exact sound you're searching for. "People come in and are shocked by the volume of gear," says Lynch, whose domain is the effects pedals. "The pedal counter is an eye catcher to those who have never been to the store; it's like candy for musicians. It looks like a sea of effects pedals." "We try to stock lots of choices of anything you might be looking for," says Minui. "We've always made it our goal to offer a wide variety of products at our store, to cater to the individual tastes and preferences of all different kinds of players, because music is a really personal thing. It's definitely not a 'one-size-fits-all' kind of business." They're also very competitive and very customer-focused. They'll beat Internet and competitors' prices; they take trade-ins and offer layaway. "We work with people however we can, and it's our goal to give people more than they expect when they come to Motor City," says Minui. Motor City Guitar is so much more than just a music store, both to the Minuis and to their loyal clientele. The Minuis treat everyone like family because they actually view everyone as family. "The majority of our customers are regular people, like ourselves," says Minui. "We all love listening to music, playing music, and dreaming about the gear that helps us makes music. It's a very personal thing, and so is the music business, and it's really rewarding helping people express themselves in a way that only music can." In addition to all of this, the store also offers repair services and lessons for all levels of ability. They also recently launched their online store, where you can check out the inventory (though the online inventory is not yet complete), then come in and test out whatever you want. Order it online, if you must, but where is the fun in that? When asked what he and his wife are most proud of with their long-running independent music store, Minui says, "When we see someone leaving the store with a big smile on their face. Or when they stop and say that someone at our store helped them find just what they were hoping for -- that makes us feel really proud. Or when somebody plays us a song that they wrote, or hands us a recording of their music and says that we helped them with it somehow. That is a really great feeling." Mr. Alan's is now Elite Mr. Alan's, a place for finding the latest trends in shoes and clothing, not just the best bargains.